Agricultural Water And Pressure Systems - EADES WELL DRILLING INC.
Water has a direct cor­re­la­tion to prod­uct qual­i­ty and prod­uct quan­ti­ty, regard­less of mar­ket prices. In short, the bet­ter the water, the bet­ter the live­stock. Respon­si­ble agri­cul­tur­al oper­a­tions prac­tic­ing good hus­bandry under­stand water is the piv­otal point to all oper­a­tions. Hap­py, stress free ani­mals grow larg­er, eat more for­age, are more dis­ease resis­tant and are bet­ter pro­duc­ers in all respects includ­ing sound and strong off­spring. fresh, clean water is imper­a­tive for well­be­ing. 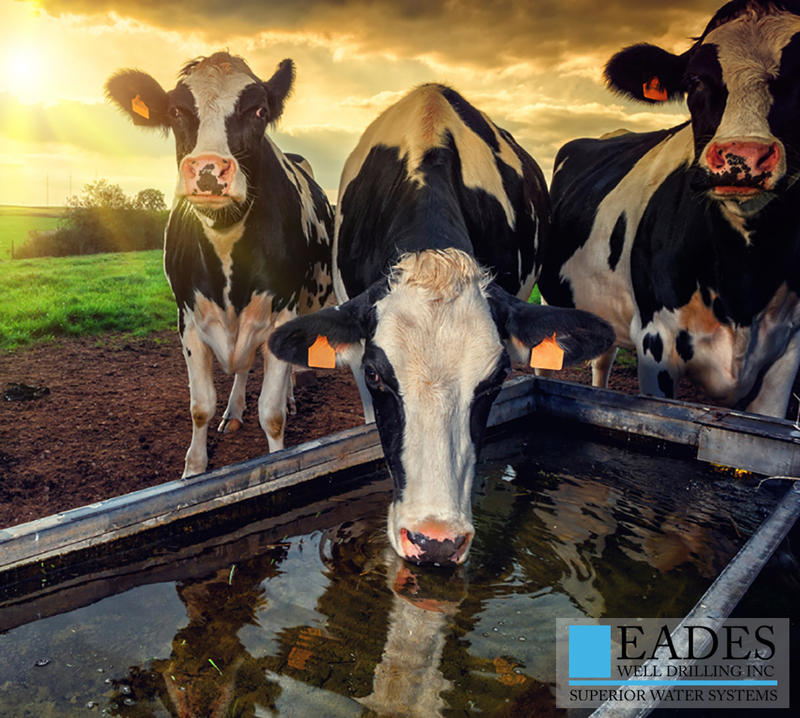 The require­ment for fresh water is influ­enced by numer­ous fac­tors such as the animal’s activ­i­ty, air tem­per­a­ture, humid­i­ty, res­pi­ra­to­ry rate, water intake, feed con­sump­tion, and sev­er­al phys­i­o­log­i­cal fac­tors such as age, repro­duc­tive sta­tus (e.g. dry, preg­nant, lac­tat­ing), milk pro­duc­tion and many oth­er fac­tors. Hap­py, healthy, and stress free ani­mals with unlim­it­ed, fresh clean water are the pri­ma­ry fac­tors, oth­er than genet­ics, (both have a cause and effect cor­re­la­tion) to over­all live­stock prof­itabil­i­ty. Water qual­i­ty may change over time and pre­vi­ous analy­sis is not a indi­ca­tor of cur­rent qual­i­ty. Water sources need to be test­ed reg­u­lar­ly. Strong healthy live­stock to lush green boun­ti­ful crops rely on clean water for dis­ease free growth and life itself. Plen­ty of water, pres­sure sys­tems to deliv­er it where need­ed, assists Moth­er Nature to do her thing. Clean drink­ing water is one thing, pres­sure sys­tems for all deliv­ery require­ments is anoth­er. Shal­low wells, deep wells, low yield wells, cis­terns, hold­ing tanks to high yield flow wells and direct deliv­ery have dif­fer­ent require­ments. 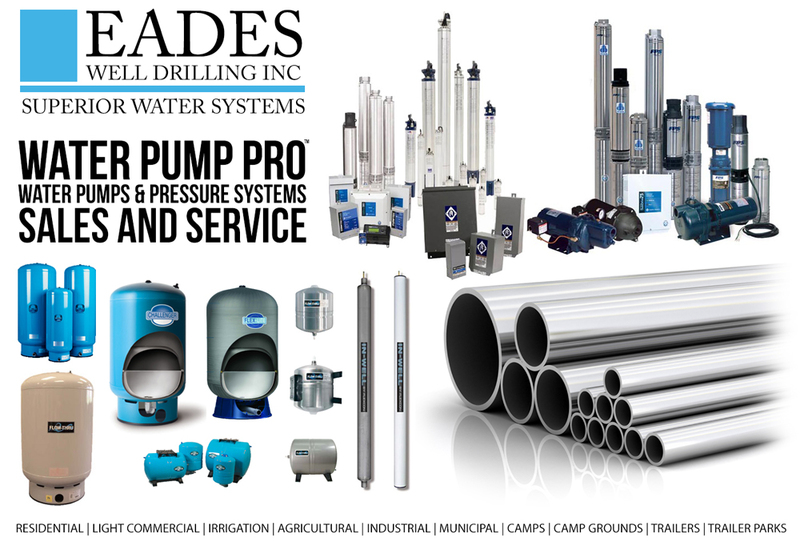 EADES WELL DRILLING pro­vides sub­mersible pumps, sur­face pumps, pres­sure sys­tems and tanks for your requirments. Problematic water wells and pumps ? A lit­tle knowl­edge is dan­ger­ous. Bac­te­ria may be intro­duced to the well when pumps are removed for repair and laid on the ground. To the untrained eye, what is seen is not under­stood. Oth­er symp­toms and future prob­lems can be diag­nosed by a trained pro­fes­sion­al with pre­ven­ta­tive mea­sures tak­en. Oth­er prob­lems such as IRBs and SRBs (as well as oth­er bac­te­ria) can exist nat­u­ral­ly in ground­wa­ter. Leave all water sys­tem repairs to the pro­fes­sion­als. An ounce of pre­ven­tion is worth a ton of cure. 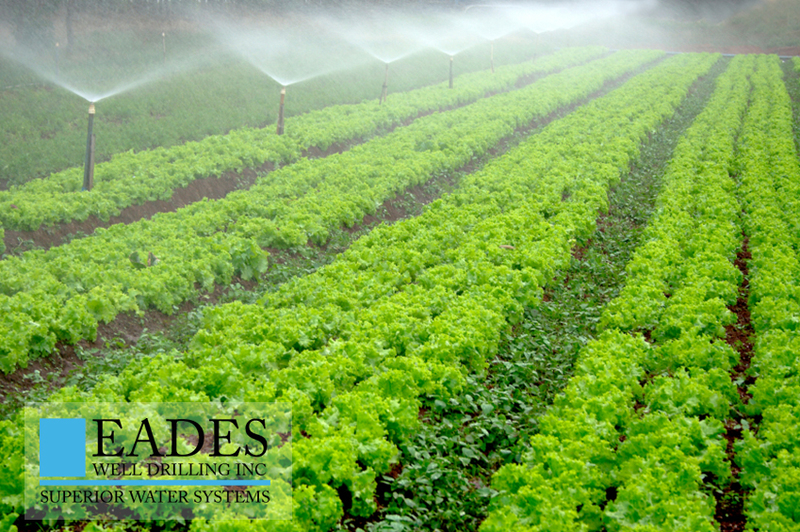 EADES WELL DRILLING AGRICULTURAL SYSTEMS pro­vides source water to deliv­ery and pres­sure sys­tems for all agri­cul­tur­al require­ments.